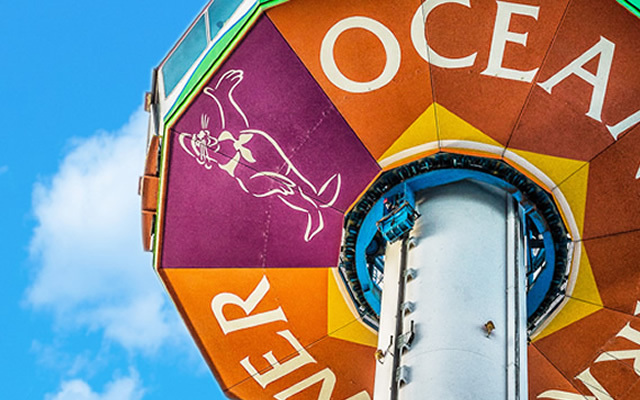 Explore what Ocean Park is all about. Ocean Park today celebrated the birthday of its four giant pandas and invited Mr. Blythe Ryan Fitzwiliam, Adjudicator of GUINNESS WORLD RECORDS™, to announce on-site that female giant panda Jia Jia, who is turning 37 years old , has set two GUINNESS WORLD RECORDS™ titles for the longevity of giant pandas under human care. Jia Jia has been officially recognised as “Oldest panda ever in captivity” and “Oldest panda living in captivity”. Another male giant panda, An An, who will soon turn 29 , is the world’s second oldest living male giant panda under human care. The younger giant panda Ying Ying, who participated in the National Giant Panda Breeding Programme this year for the first time, had returned from Sichuan on 25 July 2015. In celebration of these remarkable milestones, Mrs. Carrie Lam Cheng Yuet-ngor, Chief Secretary for Administration; Dr. Ko Wing-man, Secretary for Food and Health; Miss Petty Lai, Principal Assistant Secretary (Recreation and Sport Division) for Home Affairs; Mr. Li Desheng, Deputy Director of Sichuan Wolong National Nature Reserve Administration; and Mr. Leo Kung, Chairman of Ocean Park, took part in the giant pandas’ birthday party with 200 local senior citizens and their caregivers from Helping Hand. To celebrate the birthday of the four giant pandas, Jia Jia setting two GUINNESS WORLD RECORDS™ titles, as well as to promote the culture of respecting and caring for the elderly, four companions of each visiting senior can enjoy a 30% discount on regular admission tickets during August. As part of the celebration, the Park has also introduced an elderly friendly healthy panda-themed menu, which has been endorsed by a professional dietitian. Furthermore, all Hong Kong residents born in the month of August can enjoy free admission on any one day during their birthday month to celebrate their birthdays with the giant pandas, and up to four companions can receive 30% off on regular admission tickets. On the other hand, the younger giant pandas Ying Ying and Le Le are in good health. During Ying Ying’s visit to Sichuan for her participation in the National Giant Panda Breeding Programme, she attempted mating with two of the males for a total of five times and eventually mated once. Ying Ying also received artificial insemination to maximise her chances of pregnancy. In celebration of their birthday, the four giant pandas enjoyed their favourite icy birthday cakes sponsored by Häagen-Dazs™. What’s more, to promote an elderly friendly culture, the Park will launch in August a healthy panda-themed menu that has been endorsed by a professional dietitian. The menu features Panda Bento Boxes for vegetarians and non-vegetarians respectively, as well as Panda Birthday Cupcake. The Park has also partnered with “The 1600 Pandas Volunteer Team” to offer a papier-mâché panda workshop on selected Sundays this August (9, 16 & 23 August) for guests to create their own papier-mâché pandas, as well as learn about panda conservation and concept of sustainability. Besides celebrating with the giant pandas at the Park, guests can also send a birthday greeting to the giant pandas through a specially created section on Ocean Park’s homepage https://panda.oceanpark.com.hk) from 3 August onwards. Every 50th entry will be awarded a Häagen-Dazs™ coupon while stock lasts. Ocean Park will also launch a “Summer Nights” promotion* during which the Park will extend its hours of operation to 9:00p.m. on all Saturdays and Sundays during August. Adults and children guests can enjoy a special discounted price of $198 and $99 respectively on these nights when they enter the Park from 4:00p.m. onwards. LINE users who have sent a message with the words “Summer Night” to the “summersplash” official LINE account will receive an e-coupon. Upon presenting the e-coupon at 7-Eleven stores, guests can purchase summer night admission tickets at HK$158 (adult) and HK$79 (child) (a maximum of 4 tickets can be redeemed on a single purchase). Moreover, guests who purchase or renew a SmartFun Annual Pass from now till 30 August will receive a set of discount coupons for in-park spending. Also, SmartFun Annual Pass holders can enjoy 35% off on selected panda merchandise. In addition, all Hong Kong residents aged 65 or above as well as all SmartFun Annual Pass holders can enjoy approximately 30% off on the new Panda Bento Box at Panda Café during August. The “Ocean Park” official LINE account users can present a discount e-coupon to redeem the “buy one get one free” offer on the LINE Character set at Neptune’s Restaurant after 3:00p.m. from Monday to Friday during August, and take photos with LINE Friends while enjoying the delicacies. Ocean Park continues to offer free admission for all Hong Kong senior citizens aged 65 or above throughout the year. During August, four companions of each visiting senior can even enjoy a 30% discount on regular admission tickets. All Hong Kong residents aged 65 or above as well as all SmartFun Annual Pass holders can enjoy approximately 30% off on the new Panda Bento Box at Panda Café in the afternoon during August. All Hong Kong citizens who were born in August are offered free admission on any one day this August and up to four accompanying guests can get 30% off on regular admission tickets. SmartFun Annual Pass holders can enjoy 35% off on selected panda merchandise. Guests who purchase or renew a SmartFun Annual Pass from now till 30 August will receive a set of discount coupons for in-park spending. LINE users who have sent a message with the words “Summer Night” to “summersplash” official LINE account will receive an e-coupon. Upon presenting the e-coupon at 7-Eleven stores, guests can purchase summer night admission tickets at HK$158 (adult) and HK$79 (child) (a maximum of 4 tickets can be redeemed on a single purchase)　and receive an exclusive LINE tattoo sticker at turnstile. The hours of operation during “Summer Nights” will be extended to 9:00p.m. on all Saturdays and Sundays this August (i.e. 1, 2, 8, 9, 15, 16, 22, 23, 29, 30 August). Adult and child guests can enjoy a special discounted price of $198 and $99 respectively to enter the Park on these nights from 4:00p.m. onwards. *Holders of daytime tickets are entitled to stay in the park until the extended closing time. Nighttime tickets are available at Ocean Park ticket offices, official websites and 7-Eleven stores (now till 30 August). For details, please refer to the latest promotional information from Ocean Park. © Copyright Ocean Park Hong Kong. All rights reserved.